The screen uses a TN panel which provides minimal input lag and a high refresh rate making this the best 144Hz budget gaming screen available today. The trade off is the TN panels washed out colors, if your a casual gamer that can't deal with the washed out color gamut we recommend you check out our round up of the best gaming displays and view some of the IPS displays such as the PG348Q. Asus is a tech company that has been producing high-quality products since 1989. They are based out of Taiwan but have taken the international gaming community by storm with their vast array of monitors, laptops, motherboards, graphics cards, and more. The masterful company currently offers 34 different gaming displays ranging from small 21.5” screens to sizeable 31.5” screens. These also come in a range of resolutions all the way up to an impressive 4k in addition to refresh rates and response times that lead the market. If you aren’t familiar with Asus, you should be, because their value is unprecedented, and their products are highly competitive. One of Asus’ most popular and best-selling gaming screens is the Asus VG248Q. 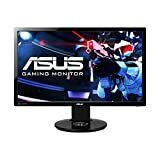 This monitor can be purchased from most online sites for $279.99 or less. That price is quite respectable and reasonable as far as quality gaming displays go. The inexpensive price coupled with the device’s many impressive features make it a tempting buy for many gamers. Hopefully, this Asus VG248Q 144Hz review will give you a little bit more insight into this device and help you determine if it is the right monitor for your gaming endeavors. For being a very light monitor weighing in at just 12.3 pounds, the Asus VG248Q 144Hz monitor is still sturdy and stable. The balance in weight and durability, along with a sleek design are some of the features that Asus products are known for, and the VG248Q 144Hz is no different. This monitor’s design is simple yet effective. Its glossy black coloration is uncomplicated yet sophisticated. The stand allows for complete mobility, offering swivel, pivot, rotation, tilt, and height adjustment capabilities. It allows the user to achieve the perfect configuration for their desired style of gameplay. Its fairly compact screen makes it perfect for small desk spaces or for desks that need to house several screens. It is also very easy to install and connect to your computer, so you’ll be up and playing in no time. The design of this monitor is practical, user-friendly and classy at the same time. The performance of the VG248Q 144Hz overall is respectable, but not overwhelmingly outstanding. The color accuracy is merely decent, and it has narrow viewing angles that can disrupt the color even more. The most impressive features of this device are its mind-blowingly quick response time and refresh rate and input lag. They are both unprecedented and create an unforgettable gaming experience with absolutely no lag or choppiness whatsoever. These features can completely revolutionize your gameplay and take it to a whole new level. This device is also compatible with 3D gaming, including the Nvidia 3D Vision 2. If additional equipment is purchased, this monitor allows gamers many more options than previous models could. The biggest obvious pro about this device is its amazing refresh rate and response time. The technology to produce refresh rates this fast didn’t even exist two years ago. This monitor’s incredible capabilities in both categories combine to make an amazing gaming experience for its users that basically eliminates lag and makes images clearer. In addition, a lot of quality monitors force gamers to drop hundreds and hundreds of dollars to obtain, but this one, coming in at a smooth $279.99, is a wonderful deal that will take a lot of strain off gamers’ wallets. The color quality is not ideal on this device, but it’s not bad enough to make games unplayable. However, if you might use the monitor for color-sensitive activities such as photography then you may want to consider a different device or take the time to calibrate it extensively. One thing that many gamers don’t initially realize is that the 144Hz refresh rate only applies to devices that hook into the monitor via the DisplayPort or Dual-Link DVI-D. The 144Hz refresh rate will not operate up to speed if a device is connected using the HDMI plug-in. This isn’t a huge issue as the refresh rate will only be slightly delayed, but if you exclusively play HDMI compatible devices then you may want to look for a different 144Hz monitor. The final major complaint that gamers have is that the internal speakers aren’t great, but honestly, it is doubtful that there is a single monitor out there that has its users raving about its speakers. It should just be taken into consideration that the purchase of external speakers is advisable if sound quality is something that is important to you. The Asus VG248Q is a solid, reliable monitor that makes for some very satisfying gameplay. If you want a respectable, inexpensive monitor that features some of the most impressive features on the market today, then this device is perfect for you. Honestly, getting a 144Hz monitor for less than $300 is almost unheard of and should not be overlooked. The major cons that gamers talk about don’t outweigh the extreme benefits. Most of them can be easily fixed or learned to live with. There is a reason that this monitor is one of the most commonly purchased gaming devices out there. If you want to add a great monitor to your gaming collection without breaking the bank, then this monitor is definitely the one.